It was a hectic month where in the 30 days, 25 were spent mapping. A modem left in Maseru was loaded with credit made its way all around the country, …twice in fact. Among all that it got stuck in the Mountains of Thaba Tseka during a snow storm. However, the schedule got condensed and quite a lot of extra days were squeezed in on Saturdays and overlapping in the final week. Looking at the month in the available statistics it would certainly appear that it was well worth every effort to organise the twenty five separate mapathons. Some mapathons were well attended, especially where people who had learned a little OSM had never had a proper one. Other mapathons were less well attended, with a few brave mappers left to carry the load for their district as others cancelled here and there. With an engagement target set for the training and engagement team the mapathons held this month saw the creation of approximately 40 new mappers. The lovely stats made available by Pascal Neis show that Lesotho had between 8 and 26 mappers active in Lesotho, excluding sundays. The final Mapathon was a bigger affair. Over thirty people participated, most of these seasoned mappers, and also relatively new ones who improved along the way. The mappers attending on this day all downloaded JOSM to boost their speed and variety. It kicked off after a welcome by Mahipi and then with Topollo Lesoli getting very excited indeed and speaking that special language of hers that no other Mosotho can understand. Also present was Mpaleng, who was trying to help her colleagues back at HQ in Mohale’s Hoek. There was a presentation by Lesotho’s leading mapper on what the data being created can be used to do within the sphere of Planning. 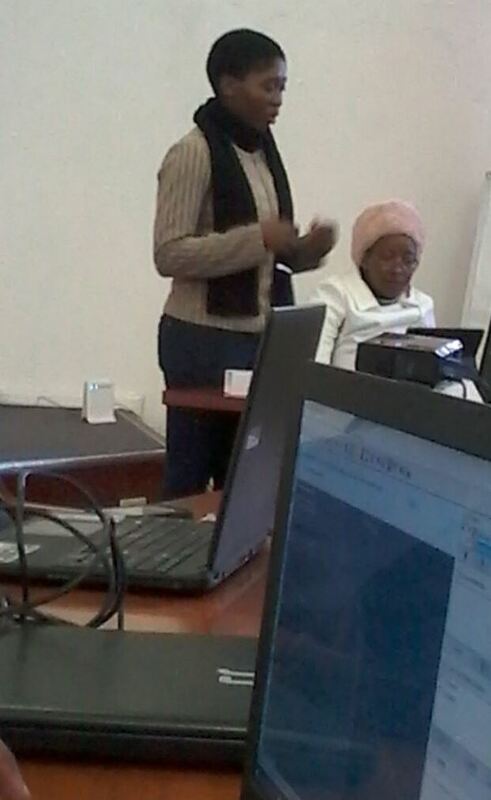 Tshedy’s abilities in extracting and re-analysing data in QGIS allow her to be one of a very small number of authoritative voices on the subject. Tshedy felt that new mappers should know why #MapLesotho exists, and she did her very best to explain all the planning matters that can be more easily solved with decent maps. Tshedy was one of five people in Lesotho who can use PostGis and SQL to take large amounts of data out of the OSM database. There was a major contribution about tagging delivered by the ever patient and ever present Lineo. At this stage it is right to recognise that nobody came near the contribution of Lineo to helping the mapathons. She attended and assisted new mappers at five of the mapathons. Without her safe hands several of these would have failed. And then the surprise visitor arrived!! This was Honourable Minister for Local Government and Chieftainship Pontso Sekatle, who fresh from signing the Memorandum of Understanding with Fingal County Council and having been set up on OpenStreetMap by Colin McAndrew wanted to show her mapping skills to the Basotho OpenStreetMap community. The Minister was joined by The Principal Secretary Mme Panyane and the Commissioner for Lands Mme Lebeta. All in all it was a great day for all concerned the Minister coming for the wrap up was a great surprise to everyone. So many jokes and laughter were shared all day, and of course a lot of mapping got done. #MapLesotho month is finished. Bring on July.